Apart from the potential human tragedy and loss, bushfires often result in a temporary loss of landscape amenity. Following bushfires there is often apprehension by those directly affected about replanting trees adjacent to homes and other buildings. The benefits of trees in our landscapes are significant and well documented. 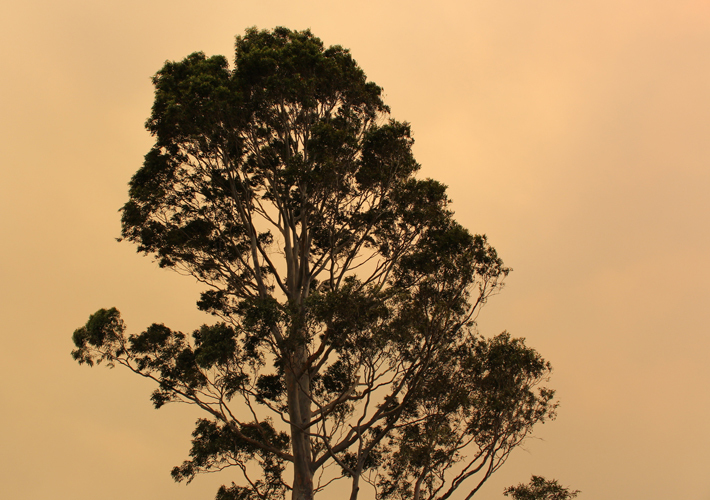 The use of fire retardant trees in areas prone to bushfires can not only add beauty to our gardens but, when selected and placed appropriately, fire retardant trees can assist in safeguarding homes in the advent of a bushfire. Trees with the best fire-retardant properties are those which have soft leaves with a high moisture content, smooth and non-peeling barks, and low volatility oils in their foliage. In general this includes the majority of deciduous trees and some evergreens from the sub-tropics and rain forests. Non-fire retardant trees that create or hold on to lots of dry dead branches and debris, have loose flaky bark, have dense fine foliage with a low moisture content should be avoided. All plants, whether they are exotic or Australian, will burn when subjected to sufficient heat. Different fire conditions have varying effects at different times on the same species. The fire retardant tree selections made here will not guarantee safety in a bush fire. Instead, the following selection of fire retardant trees, if correctly sited, can complement fire management plans for individual homes by serving as a wind break absorbing and deflecting radiant heat from the fire and acting as a barrier to flying sparks and embers. Fire retardant trees and landscapes must be part of a complete fire planning system and ongoing diligence in managing your site. Site management includes maintaining trees in a healthy condition, for example keeping soil moist, pruning out dead wood and cleaning up debris and leaf litter. The following list is not definitive. Further information can be sought from the references listed below and from local authorities. The following fire retardant trees could be used for specimen plantings. Planting of fire retardant trees should take into consideration separation distances between buildings. Acacia melanoxylon (Blackwood). Tree will vary in size dependent on climate and soil type. Height, 8-15m. Acer negundo ‘Sensation’ (Variety of Box-elder Maple). Deciduous, broad domed, medium sized tree grows to 12-15 m.
Banksia integrifolia (Coast Banksia). Variable tree up to 10 metres high. Brachychiton acerifolius (Illawarra Flame Tree). Pyramidal tree 8-15m height. Brachychiton populneus (Kurrajong) Domed evergreen tree, up to 12-20m. Cupaniopsis anacardioides (Tuckeroo). Broad-domed evergreen tree 8-12m high. Lophostemon confertus (Queensland Brush Box). Broad-domed evergreen tree 10-15 m high. Melia azedarach (White Cedar). Broad-domed, deciduous tree. Height, 8-15 m.
Quercus canariensis (Algerian Oak). Large, broad domed tree. Grows to 20-25 m. high. Stenocarpus sinuatus (Firewheel Tree). Upright tree 8-14 m in height. Syzygium paniculatum (Magenta Brush Cherry). Narrow to broad-domed evergreen tree 10-15 m high. Tristaniopsis laurina (Water Gum, Kanooka). Small, broad-domed tree 6-8 m in height. Acmena smithii var. minor (Lilly Pilly). Small tree, bronzy new growth 3-6m high. Acmena smithii ‘Hot Flush’ (Lilly Pilly var.) Up to 3m with moderate growth habit and reddish new growth. Eleaocarpus eumundii (Eumundi Quandong). Moderate sized conical tree to 8-10m tall by 3m. Hymenosporum flavum (Native Frangipani). Narrow tree grows to 10m in height. Best used in clumps or groups. Pyrus calleryana ‘Capital’ (Callery Pear var.) Deciduous, columnar tree to 12m. Trees damaged by bushfire that are close to buildings, driveways or other high target areas should be inspected by a qualified arborist to ascertain tree hazard and appropriate remedial works. Some trees, although looking irreparable from external appearance, may recover.